Statistics Show that 85% of All Buyers Use the Internet First To Find Their Home. The Internet Has Replaced Traditional Newspapers Advertising and is Critical that Your Home have A Strong Presence on The Internet with Professional Photography, Nationwide & International Exposure, and Correct Pricing Of Your Home To Grab The Buyers Attention. 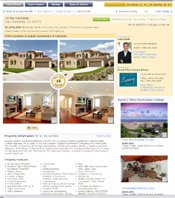 We Proudly Showcase All of our Listings on Realtor.com, #1 website used for Real Estate. Your home will be featured on sites like Realtor.com, LATimes.com, RealEstate.com, BeachCitiesRealEstate.com, Homeseekers.com, Trulia.com, , Yahoo.com, MSN.com, Homes.com, Redfin.com, OCRegister.com and every single Real Estate Agents website that subscribes to IDX Technology! Custom Brochures Of Your Home. We use professional photography to first showcase your home through photography. We then provide these high resolution images into two sided color brochures that showcase your homes best features. Virtual & Video Tours tell a story about your home. They go beyond what photos can portray and make it like you are actually at the property. As Technology advances, more and more buyers are looking for virtual images of thier next home and we are proud to be on the cutting edge and offer a custom website of your home. 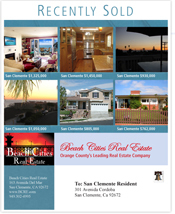 Custom Email Campaign suited to your home. We auto-notify all the clients in our database that your home has been just listed. We also send out a broker preview campaign to all local real estate agents to come preview your home. 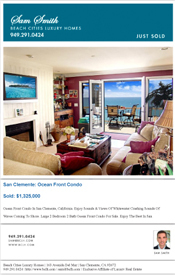 Open House, Just Reduced, Just Sold Are Just Some of the Custom Campaigns That We provide for our clients. We market your home using the best available print media that will expose your property to the corner local or international buyer. We believe marketing your home is the most important step in getting your home sold. 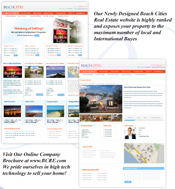 Our Newly Designed Beach Cities Real Estate website is highly ranked and exposes your property to the maximum number of local and International Buyers. Visit Our Online Company Brochure. We pride ourselves in high tech technology to sell your home! 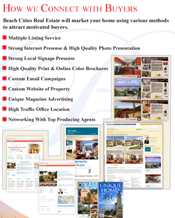 Our Direct Mail Approach Reaches Potential Buyers Who May Purchase Your Home. Weekly Preparation of New Marketing of Home.